The largest outdoor rail show in Europe, Rail Live is almost upon us, with everything from traction & rolling stock, rail plant and infrastructure, electrification and signalling demonstrations; to displays of engineering, rail maintenance materials & product development/testing safety, digital products and innovation. 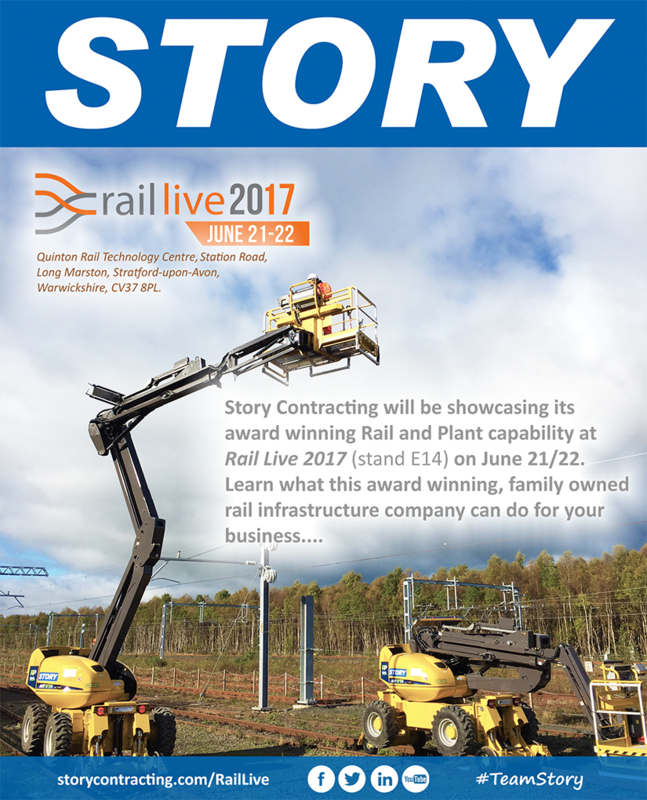 Story Contracting will be showcasing its award winning Rail and Plant capability at Rail Live 2017 (stand E14), on June 21/22. This will include a display of our cutting edge plant machinery, an interactive simulator demonstration and an opportunity to hear about the various rail infrastructure projects we’ve undertaken as a business, and our innovations within the industry. Story have also been nominated for 6 Network Rail awards: Most Improved RRV Supplier, Best Performing RRV Supplier, Rail PPS Root Cause Analysis, Continuous Improvement Award, Plant Engineer of the Year, and Share with Pride Champion. The winners of the Network Rail awards will be announced at Rail Live on June 21st. For any queries relating to Rail Live, please contact Mark Hendren on 07793 307 968, or mark.hendren@storycontracting.com.